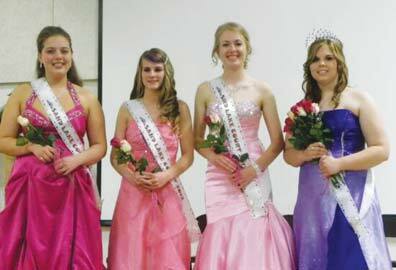 Miss Sand Lake and Court (L to R): Court members Shana Shquair, Tonya Rivard and Natasha Azur, and Queen Kristina Nozal. Junior Miss Sand Lake Nicole Masion, and Queen Kristina Nozal. The Sand Lake Fourth of July Celebration kicks off Wednesday, July 4, and part of that celebration will be the crowning of Miss Sand Lake and Miss Junior Sand Lake at noon. 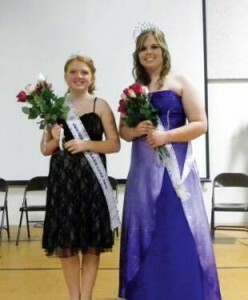 The Miss Sand Lake and Junior Miss Sand Lake pageant was held on May 3, 2012. Chosen as Miss Sand Lake was Kristina Nozal. She lives in Sand Lake and attends Tri County High School. She is involved with the Equestrian Team and 4-H and enjoys spending time with friends and family. The Queen’s court includes Shana Shquair, Tonya Rivard, and Natasha Azur. Shana lives in Sand Lake and attends Tri-County High School. She is involved as a volunteer soccer coach, with the National Honor Society, and enjoys jazz music. Tonya lives in Pierson and graduated from Tri-County High School in 2011 and is now attending Montcalm Community College, spending her time riding dirt bikes, four wheelers and going mud bogging. Natasha lives in Sand Lake and attends Tri- County High School. She is involved in soccer, cheerleading, and the National Honor Society. Junior Miss Sand Lake is Nicole Masion, age 12. She is a 6th grader at Tri-County. Her interests are singing and spending time with her friends and family. Runner up was Janaye Dotson, 13. Her interests are singing, reading, and caring for animals.